Harder-Tennyson is the 11th most walkable neighborhood in Hayward with 19,065 residents. Harder-Tennyson has some public transportation and is somewhat bikeable. Nearby neighborhoods: Whitman-Wocine, Jackson Triangle, Southgate, Tennyson-Alquire, Glen Eden, Mission-Foothill and Santa Clara. Some errands can be accomplished on foot in Harder-Tennyson Hayward. 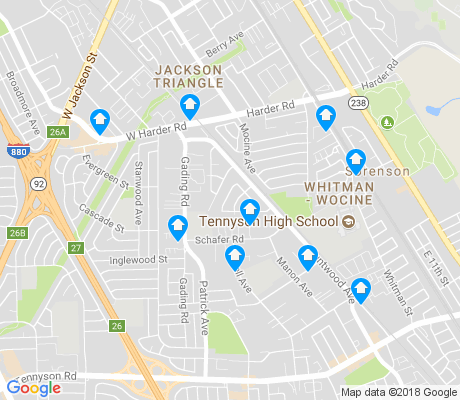 Harder-Tennyson is the 11th most walkable neighborhood in Hayward with a Walk Score of 54. Find apartments in Hayward's most walkable neighborhoods: Downtown, Burbank and North Hayward. View all Harder-Tennyson apartments on a map. Compare Harder-Tennyson to other Hayward neighborhoods. There are about 49 restaurants, bars and coffee shops in Harder-Tennyson. People in Harder-Tennyson can walk to an average of 2 restaurants, bars and coffee shops in 5 minutes.